HowToRepairGuide.com: how to replace transfer case actuator on chevy 1?2 ton? how to replace transfer case actuator on chevy 1?2 ton? Remove the transfer case shields. Remove the transfer case wiring harness connectors from the motor/encoder. Remove three bolts securing the motor/encoder gasket and motor/encoder to the transfer case. Retain the rubber gasket for reuse. Install three bolts securing the motor/encoder and the rubber gasket to the transfer case. Tighten the motor/encoder bolts to 25 Nm (18 ft. lbs.) . Ensure the motor/encoder aligns properly with the transfer case shift shaft. Align the motor/encoder mating surface detent with the transfer case mating surface detent. It is often more cost-effective to replace the sensor, but care must be used in the replacement procedure. On these vehicles, the transfer case actuator assembly consists of a permanent magnet DC motor and gear reduction assembly. When activated, it turns the shift detent lever shaft to shift the transfer case. The motor/encoder is controlled with a pulse-wide modulated (PWM) signal by the transfer case shift control module. When replacing the actuator motor or sensor (see Photo 1), shift the transfer case to Neutral prior to removing any components. This will make it easier to reassemble. If only the sensor is being replaced, be sure to assemble the harness to the new encoder with the connector legend TOP and the encoder part number facing up. With the output gear/encoder assembly in hand, carefully align the casting and output gear timing marks. At the same time, align the encoder phasing post with the phasing slot in the casting (see Photo 2) before inserting the shaft into the bushing. Also press a new seal into the cover before installing the cover. The transfer case may stop shifting on these vehicles if the transfer case shift control module senses repeated shift requests in a short period of time. The control module software has a shift abuse lockout mode to protect the module and encoder motor. If the driver tries to shift into and out of different modes continuously, the control module will stop trying to shift for several seconds to prevent abuse damage from occurring. Cycling the ignition off for 30 seconds or more should allow the transfer case to resume normal operation. Here are some pictures. 1st one is of the motorized actuator and the second is the thermal actuator. The motorized actuator will have a 5 terminal plug and will stick out of the front diff tube about 6 ". The thermal actuator will only have two wires coming out of the actuator and is only sticks out about 1 1/2 " from the axle tube. They work totally different from each other. Also remove the actuator and push in on the shift fork plunger. With the wheels off the ground you should feel the axle lock both wheels together. If this does not occur then the front diff needs to be taken apart to see what is causing the axles not to lock together. If there is power enough to light the test lamp, and the actuator does not extend, then it is a defective actuator. If you have no light at the actuator connector, then check to make sure theXXXXXfuse is good in the fuse box. 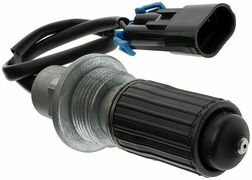 If all the fuses are good, then get under the truck and on the drivers side ,(on top of the transfer case) there is a two wire switch, with a blue and brown wire. The brown wire should have power enough to light a test lamp when the key is in run. If not then the brown wire from the transfer case to the fuse box has a break in it, and you will need to trace it and find the broken wire. ( they usually break just before the wires re-enter the cab at the shift boot on the floor). If the brown wire has power then the switch that screws into the top of the transfer case is the most likely cause. It is what connects the brown wires power to the blue wire to make the actuator work. ( also look at the blue wire from the switch to the actuator connector to make sure it is not broken. Now if the actuator extends when you turn the key on and it is in 4wd. then the rt front axle tube will need to be removed to inspect the front axle engagement sleeve. you can verify the front axle engages with the front wheels off the ground, remove the actuator and have the transfer case in two wheel drive. reach into the hole where the actuator goes in and push on the shift fork plunger and turn the wheels to see if they connect and turn, or the drive shaft spins. If not then you have internal front axle concerns, and disassembly of the axle will be needed to verify what needs to be replaced. A simple 12 volt test lamp is all you need to check the electrical part. it can be purchased at any parts store, even walmart.